Creative, dazzling and truly beautiful setting for your Royal Rabbits! I am so happy I dropped in, it's a pleasure for the eyes! I am new to blogging and have not attended Tablescape Thursdays, I do believe it'll be awesome! Hi Candy...Nice to find your blog!!!! Stop over anytime...love to have you ! Candy, how pretty is this???!!! Just too charming. 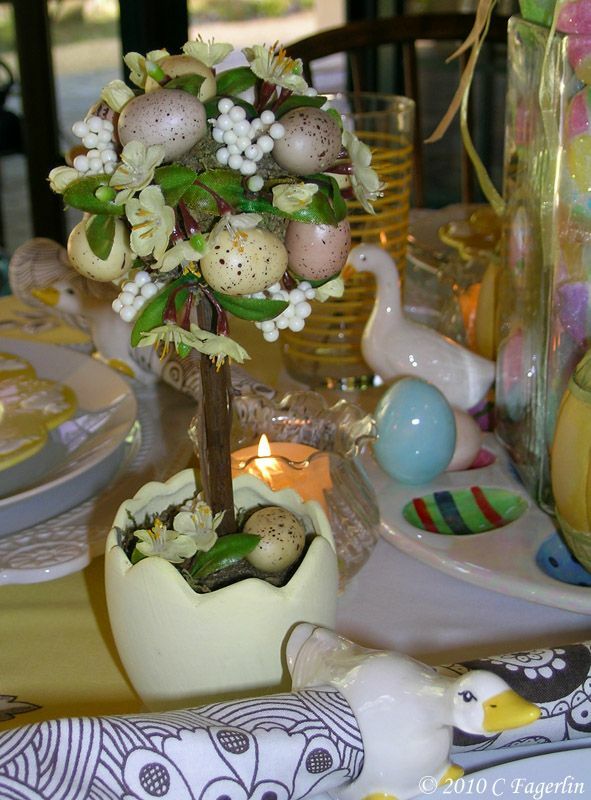 It's always fun to see what creative table setting you come up with! I love this one! Such fun! Those yellow plates are wonderful. Another charming and creative table! I love all the cheery yellow colors! The chick plates are adorable! What a pretty, fresh table! I love the yellow and black...and it looks so much like spring! Love all the bunnies! Thanks for sharing! WOOOOOOW! Candy what a charming table. Love the white chargers and the yellow chicken plates. Where did you get those white plates or chargers? They are to die for!!!. This is a fantastic table!! I love your placesettings! The chick plates are too cute!! That tablecloth is really beautiful! Great job! Oh how fun to be invited to a table with your royal rabbits! This is so bright and cheerful ...and fun! Candy, Another beautiful table! I love the King and Queen rabbits and the vase of eggs, too. 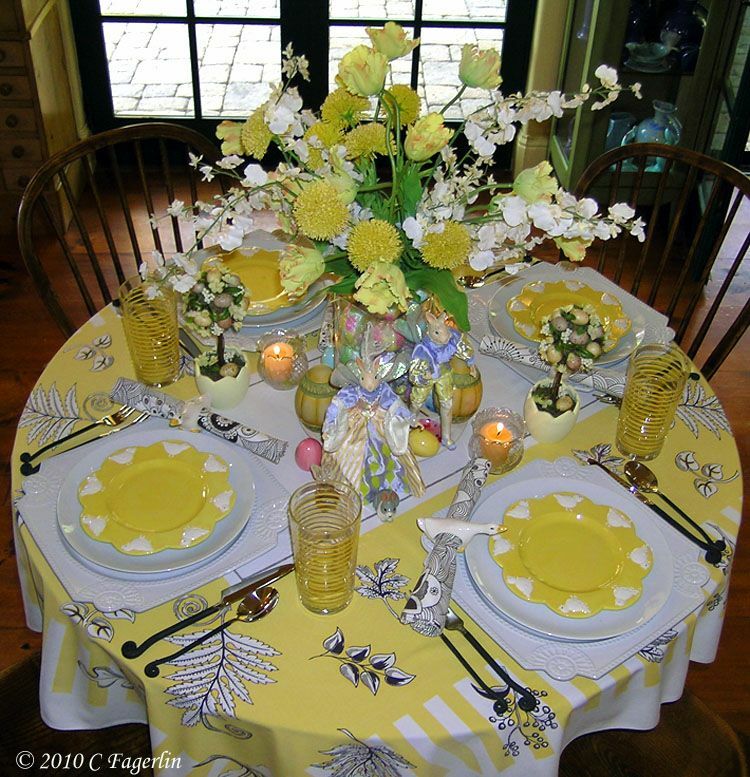 Your tablecloths are to die for and have inspired me to go to my mom's and get some of hers to use at my house! I especially love your color combinations and eye for detail. Thanks for sharing your beautifully decorated little round table with us! You do the most dazzling tablescapes and show so much imagination! I just love to see what you will do next! Your table is perfect! If I saw it in a store, I would want to purchase everything! Love yellow! The best TS so far for the Easter theme. So many Royal Subjects have stopped by to honor these Royal Bunnies! Thanks so much for stopping by, the Queen and King of all Rabbits will be making another appearance during this holiday season, so please check back often to see them again. 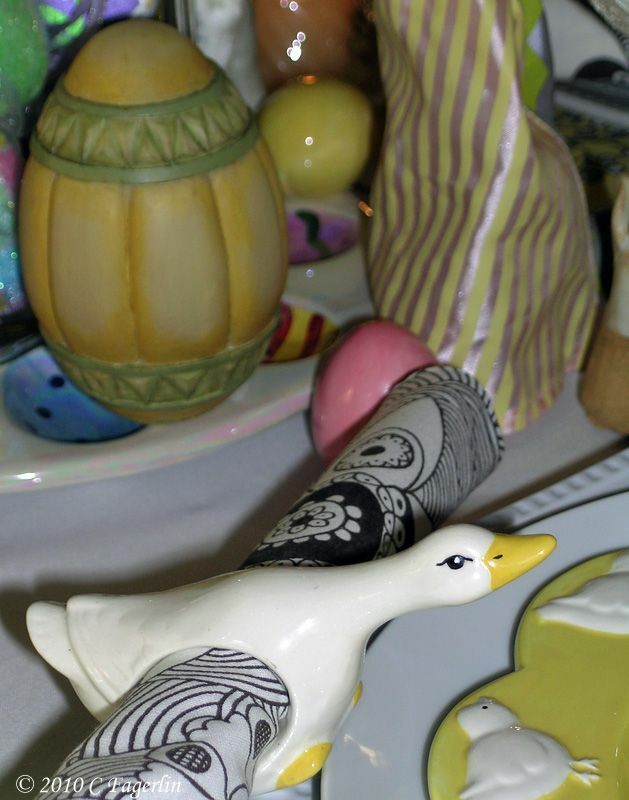 They are quite the party animals and have more tablescapes in store for your dining pleasure. Your table is so cheerful and adorable! I love the way you have mixed everything, it's just great. I almost bought those plates, and now I'm kicking myself, because they're probably gone. I sure enjoyed seeing yours. Thanks Andrea, I'm happy you stopped by! They just had these four at my Home Goods....I would have bought more, but haven't seen them again. Oh my, yours has got to be the sweetest tablescpape I've ever seen...just love it! Love that scape! Totally smitten by the gorgeous yellow plates. The graphic napkins add the perfect punch. Your floral arrangement is perfect. Love the bunnies! What a sunny delightful table. Those little chick plates are just adorable! 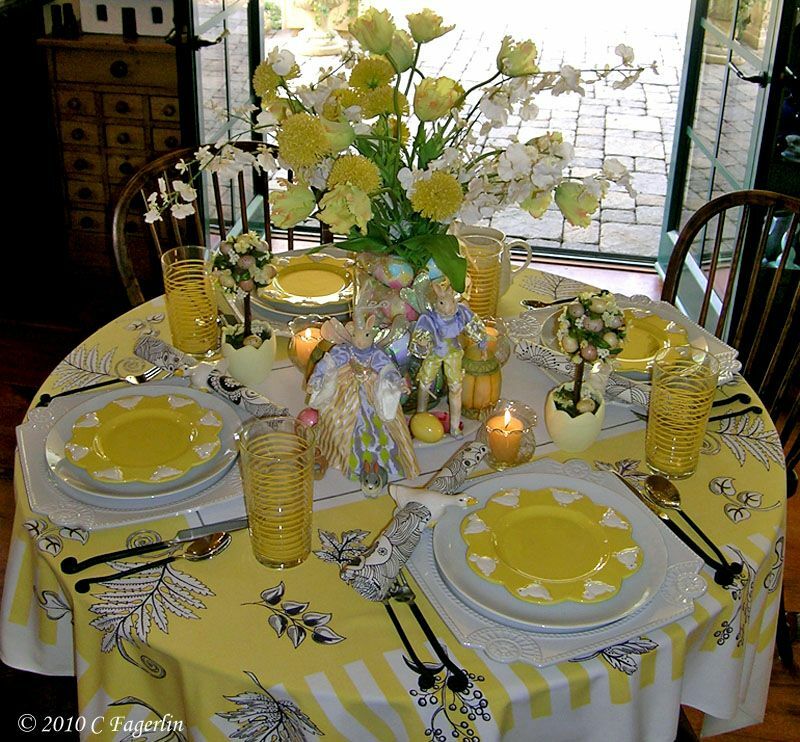 I love the dark flatware with curly tails set along with all the yellow. It really brings depth to your whmsical table! I see your rabbits are magnificently dressed and ready for Easter! YOur table is so full of beautiful detail. Those baby chick plates are too cute! Also love the beautiful, impressive floral centerpiece. The egg topiaries are wonderful. 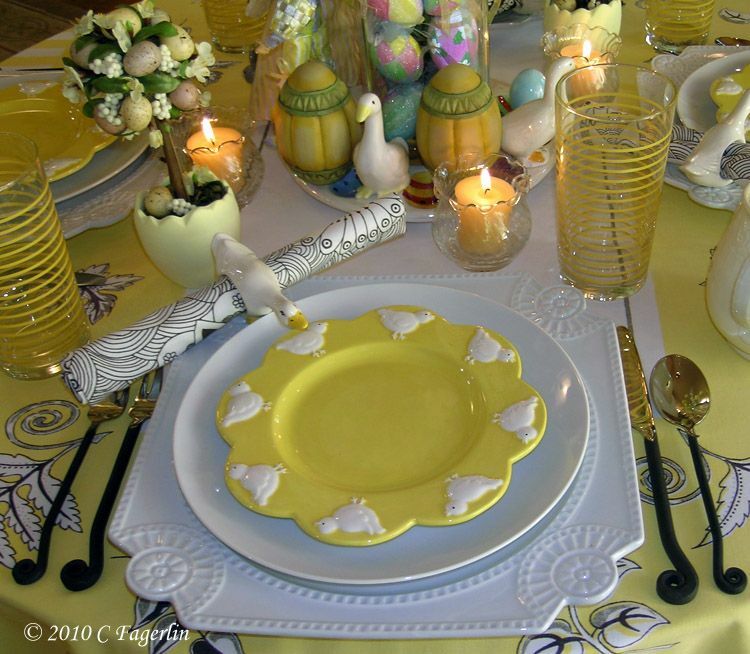 love the rabbits and the chicks on the plates .. the wonderful color. Spring has sprung! Such a sunny Happy table! 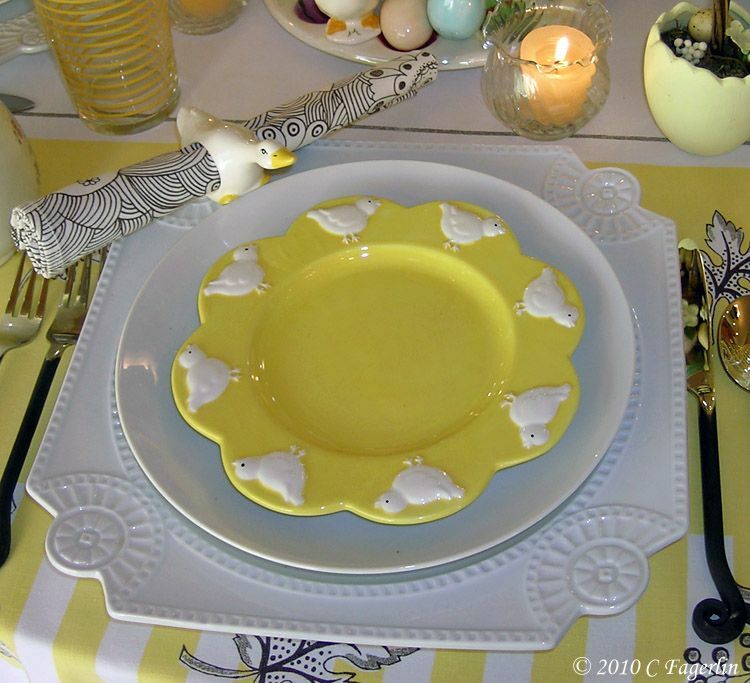 ♥ those little chick plates...adorable! I think black & white & yellow are soooo classy. Your rabbits sure are ready for Easter! What a beautifully detailed post! Hi Rabbits! It's always nice to see you again. I can't wait to see what you do this season to top your big 2010 win on VTLC! What a whimsical table! The royal rabbits are adorable and coupled with that necky white goose and the little chicks surrounding the sunshine yellow plate, it's outstandind. OMG...such gorgeous tablescape! 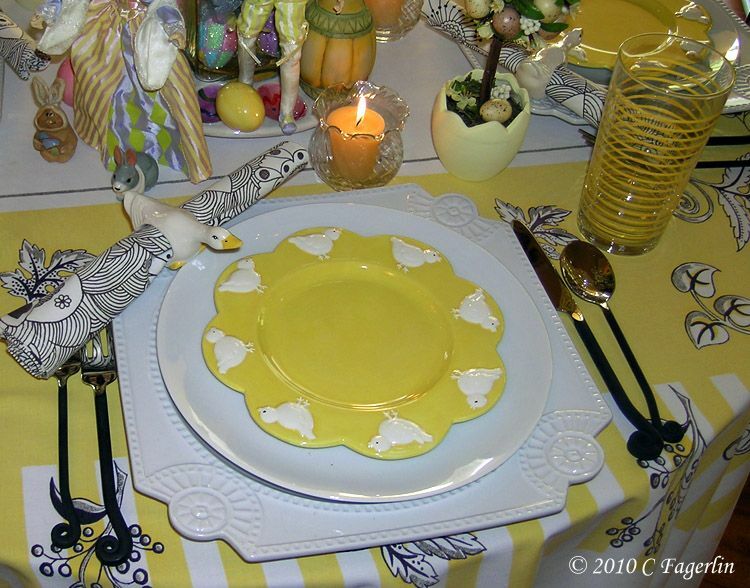 I adore all that yellow and specially the cutest chick plates! The rabbits are great, so adorable! You're ready for an Easter meal, alright. Love it! Loving the yellow! Everyone does rabbits and pink for Easter, so I really like that you focused more on the chicks and other pastel colors. Very nice! Everything is so charming! I love the plates with the little chicks on them. what can i say they are all pretty, happy mym! WOW!! That is my color!! Where do you buy your table cloth it's very pretty!!! Ohhh...I love your King and Queen bunnies! They are absolutely adorable! I also love your yellow chick plates! 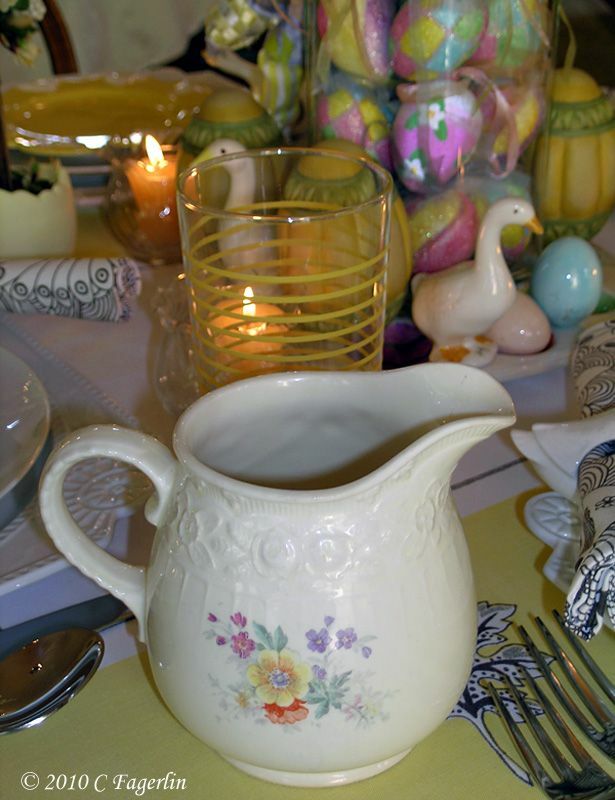 Such a pretty spring table, my friend! Thank you for sharing it with us for Sunday Favorites this week! Here's my yellow, have a great week. Thank you all for your sweet comments! This particular tablecloth came from an eBay auction, but I pick them up any chance I get when visiting antique malls, junk stores, live auctions. 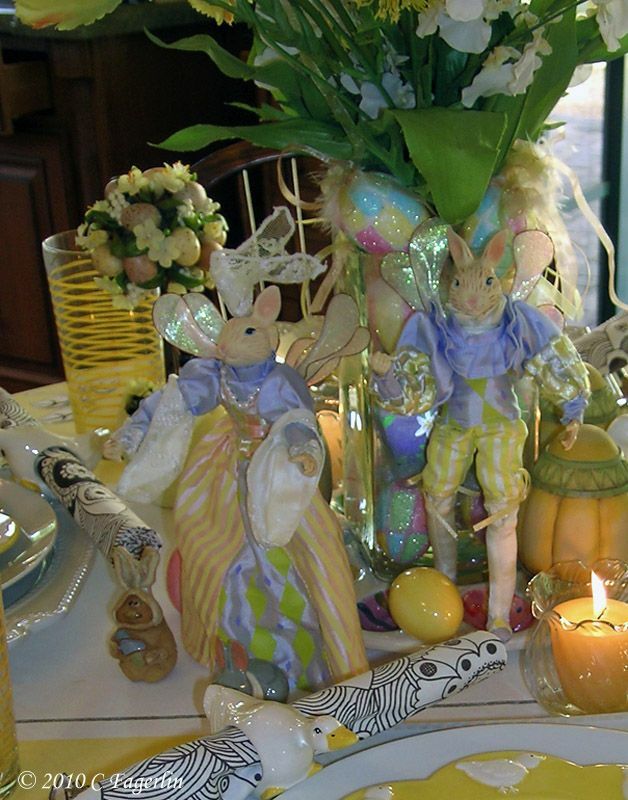 Come back often, new Easter tables coming up very soon! I love those plates too cute and the topiaries are adorable. Fun table! Thanks Jessa, I'm pleased that you enjoyed your visit!